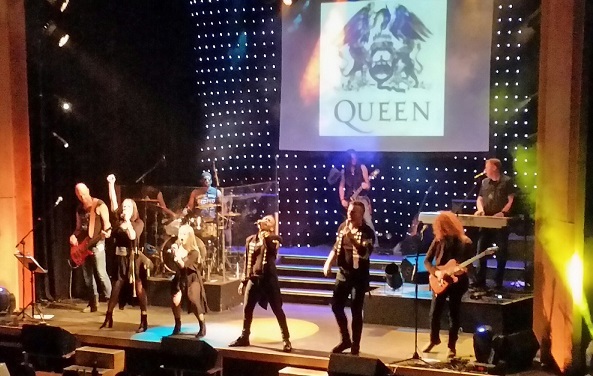 The driving force behind the Rockwood Theatre at the Sibaya Casino, Andrew Webster, along with his wife Cindy, should be commended for supporting local talent. A case in point is the backing band they have put together for their latest show, Super Bands, which opened this week and is scheduled to run until June 2. All but one of the musos, guitarist Louis Cronje, are all local lads. And boy do they gel. They display a tightness and dynamism which makes them sound as if they have been playing together for years and are not just a scratch band put together for this show. Their performance alone makes this show a must-see. Along with Cronje who is from Johannesburg, the band consists of Dillan Kanny on drums, Lloyd de Gier on bass, Evan Cullum on keyboards and - the surprise package - Rusty Red on guitar and vocals. Rusty Red, known mostly as an accomplished blues guitarist, shows that there is also rock in his soul with his brilliant guitar solos and vocals. He steals the show with his rendition of Pink Floyd’s Another Brick In The Wall, and also impresses with Dire Strait’s Money For Nothing and U2’s Beautiful Day. The show offers music from a diverse selection of bands. Whether they are all Super Bands, especially since the subtitle of the show is The Greatest Bands Of All Times, is open to debate. There can be no question about The Beatles (Help, Twist and Shout and Michelle), The Rolling Stones (Start Me Up and Satisfaction), Abba (The Winner Takes It All and Gimme Gimme Gimmie) and Queen (Bohemian Rhapsody, I Want To Break Free, Someone to Love, We Will Rock You and We are the Champions). But some of the others included in the show, such as Journey, Europe, Backstreet Boys and The Spice Girls, are in my opinion a bit questionable. However, it is hit songs from all these groups that is included in the show, so all the music is instantly recognisable and very accessible. Besides, everyone will have their own opinions as to what constitutes a Super Band. Also featured, along with the aforementioned, is music from The Jackson 5 , The Bee Gees, ACDC, Foreigner, Johnny Clegg, Toto (Africa of course - and very nicely performed), Led Zeppelin (Stairway to Heaven) and Bon Jovi. This type of musical theatre production is of course designed for an audience who wants to stomp their feet, clap their hands, sing along and generally have a party. And this show meets those needs and some. The audience at last night’s show really got into it. They seemed to know the words of all the songs and sang along with gusto. In the cast for this show is lead singer and compere Ruan Geldenhuis and, Amy Le Roux as well as 17 year-old firecracker Savanah de Beer and SA Idols top 10 contestant Sanele Mkhize. De Beer has a powerful voice and will only get better as she matures and adds a bit of sensitivity to her performance, rather than just belting everything out I also felt that Mkhize who has a fine voice was a little underused. All in all this is an entertaining show which will be enjoyed by fans of this form of musical theatre. Super Bands run until June 2, 2019. Tickets R99 on Thursday evening. Friday to Sunday tickets R130. On Sundays, children U12 are free and pensioners will receive 50% discount. Edgars and Jet Thank U Account Cards are accepted as a method of payment for all Rockwood Productions. T & Cs apply. Contact 031 010 6444 or visit Rockwood Theatre at Sibaya Casino & Entertainment Kingdom to reserve your tickets.